This has to be the biggest cist cover ever! Clach Ossian is a massive square boulder measuring 2.2 metres wide by around 1.5 metres deep and tall. It stands at the centre of a circular enclosure around 61 metres in diameter, surrounded by a turf-covered stone wall which rises to a height of around 0.9 metres. 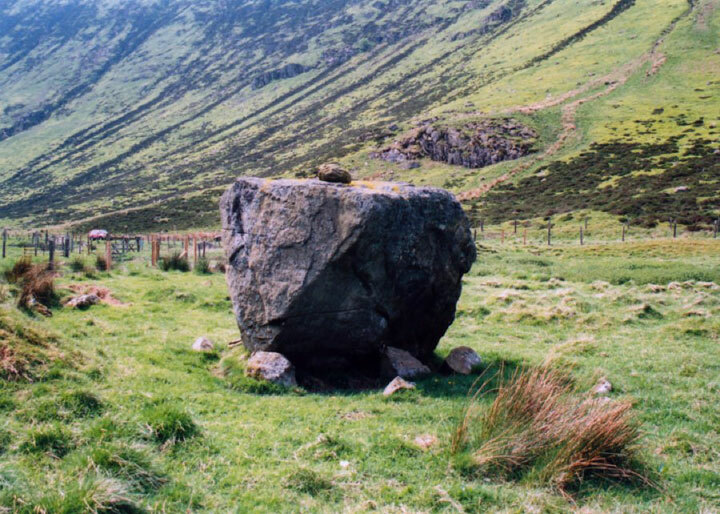 The stone was moved from its original position when General Wade‘s Military Road was being built – the builders obviously used the stone as a target from further down the Sma’ Glen then had to move it when they reached it. Underneath it was found a cist approximately 0.6 metres square, within which was found bones and “pieces of coin” which may actually have been part of some bronze implement. Nothing now remains of the cist as it was destroyed by the road builders, but it’s “cover” still stands next to the old road. There appears to have been some confusion regarding the use of the names Clach Ossian, Giant’s Grave and Soldier’s Grave over the years. A narrow grassy mound here is known as the Soldier’s Grave and is supposedly the burial site of one of Wade’s road builders who died during construction. This is sometimes wrongly referred to as the Giant’s Grave. 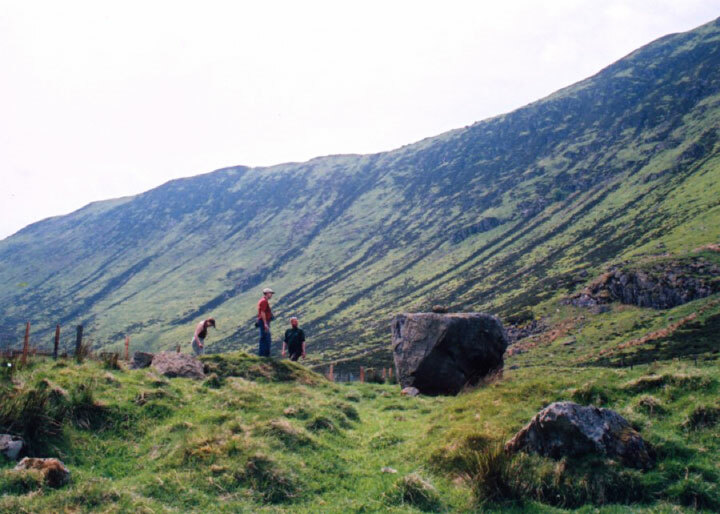 The real Giant’s Grave is a cairn further down the glen. Clach Ossian is in the parish of Fowlis Wester and the county of Perthshire. Published on the 14th of May 2010 at 4:19 pm. Updated on the 11th of May 2015 at 12:38 pm.